I’ve always been drawn to shirt dresses when it comes to sewing patterns. But in reality I don’t wear them often because they just feel a tad too dressed up for everyday mom life. That’s why when I first saw the Fringe dress pattern tester call from Chalk And Notch, I immediately jumped on it. It seemed like the perfect shirt dress with a relaxed fit yet still looking so put together. I previously made the Farrah dress and tunic by Gabriela and loved her style and instructions. The Fringe dress certainly lived up to the high expectations and I think I will be sewing many more in the future as a wardrobe staple! The test version I made is View A dress with view B sleeves turned up. 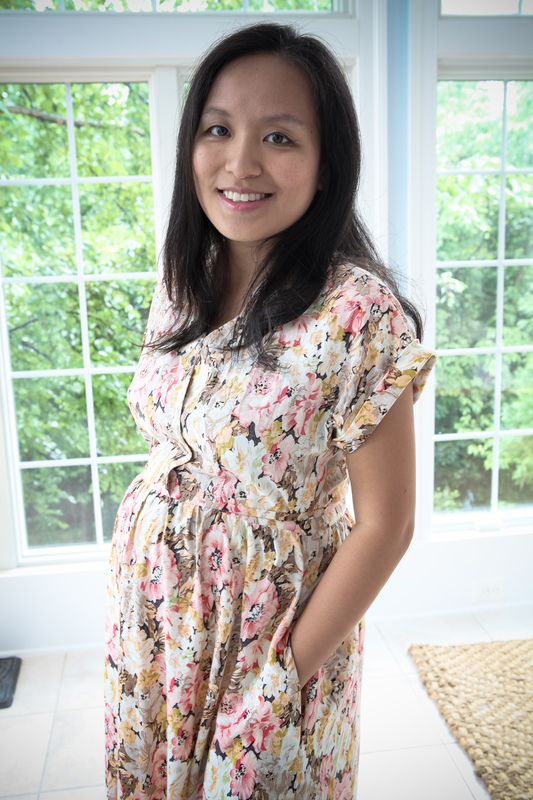 I was just into 3rd trimester pregnancy at the time and found the pattern surprisingly versatile to modify for a maternity fit. The original pattern has both front and back darts and I simply omitted the back darts and inserted ties to the front darts. The dress goes on with plenty of ease and then the ties give the high waist a little definition. – Buttons! Dress/top with buttons is a breastfeeding mom’s best friend. – Kimono sleeve with turned up cuff with just the right amount of ease. Relaxed without being frumpy. I can’t wait to sew up more Fringe dresses and tops in every color once baby is born and my measurements settle down. Grab your copy with promotional price (ends 8/28) from Chalk and Notch or UpCraftClub. Your new favorite dress awaits you! I love how this pregnancy modification turned out! I want to make one for my sister in law. Thanks for joining the test! I saw this pattern’s release & wondered how maternity-friendly/easy to modify it might be! I’m in my 2nd trimester and am really dragging with sewing lately so I hated to spend too much time on something that wouldn’t also be wearable after baby & nursing-friendly. This is perfect! 🙂 Thank you for sharing your version – it’s lovely & fits you beautifully!